Paraganglioma is a neoplasm that originates from the paraganglion cells of the urinary bladder and is the same as paraganglioma at other sites. The tumor arises from the ganglion cell in the bladder wall. Rarely, paraganglioma of the urinary bladder is associated with neurofibromatosis and urothelial carcinoma; however, it is not related to any familial syndrome. As with other bladder tumors, hematuria is the most common symptom. A more tumor-specific feature is persistent hypertension. Since the paraganglioma secretes catecholamines, a patient may have symptoms of headache, sweating, tremulousness, anxiety, and micturition syncope (the temporary loss of consciousness upon urinating). Laboratory tests for catecholamine and its metabolites in serum and urine can often help in establishing the diagnosis. Partial cystectomy is the treatment of choice. Paraganglioma may mimic high-grade urothelial carcinoma with a nest pattern. The differential diagnosis may also include melanoma and carcinoid tumor. Immunohistochemical stains are useful in helping to establish these diagnoses. Urothelial carcinoma and carcinoid tumor are positive for cytokeratin, while melanoma cells show positivity of S100, HMB45, and Melan A stains. Since paraganglia are distributed throughout the bladder wall, paraganglioma can be found in any part of the bladder. These tumors are mostly well circumscribed, and they form single small nodules, ranging from a few millimeters to a couple of centimeters. Multiple tumor nodules or tumoral aggregates are seen as well. Placing the tumor in a Zenker’s fixative turns the tumor to black in color; a positive chromaffin reaction helps in the gross diagnosis of the tumor. Histological features of the tumor are the same as in paraganglioma of other organs, including adrenal pheochromocytoma. The tumor cells grow in a zellballen pattern and are embedded in a fibrous network that is rich with blood vessels (see Media files 1-2). Microscopic appearance of paraganglioma, low magnification. Tumor cells grow in a zellballen pattern and are embedded in a fibrous network that is rich with blood vessels. 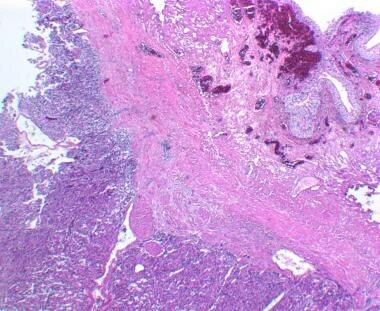 Microscopic appearance of paraganglioma, high magnification. Tumor cells grow in a zellballen pattern and are embedded in a fibrous network that is rich with blood vessels. Round tumor cells have amphophilic or acidophilic cytoplasm, containing dense granules as identified by ultrastructure study, and round or ovoid nuclei. Bizarre nuclei can be seen but have no significance. Mitosis is rare, but vascular invasion and invasive growth pattern can be present. Desmoplastic reaction is absent. Up to 15% of paraganglioma of the urinary bladder cases can develop metastasis, and metastasis is the only reliable indicator of malignancy for this tumor. Vascular invasion, a deeply invasive growth pattern, and recurrence are associated with a poor prognosis. Additional risk factors for malignancy include young age, extensive local disease, and micturition attacks. Cheng L, Leibovich BC, Cheville JC, et al. Paraganglioma of the urinary bladder: can biologic potential be predicted?. Cancer. 2000 Feb 15. 88(4):844-52. [Medline]. Heinrich E, Gattenloehner S, Mueller-Hermelink HK, Michel MS, Schoen G. Paraganglioma of urinary bladder. Urol J. 2008 Winter. 5(1):57-9. [Medline]. Linnoila RI, Keiser HR, Steinberg SM, Lack EE. 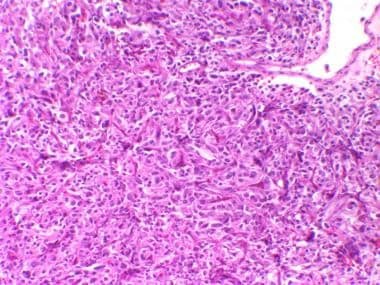 Histopathology of benign versus malignant sympathoadrenal paragangliomas: clinicopathologic study of 120 cases including unusual histologic features. Hum Pathol. 1990 Nov. 21(11):1168-80. [Medline]. Safwat AS, Bissada NK. Pheochromocytoma of the urinary bladder. Can J Urol. 2007 Dec. 14(6):3757-60. [Medline]. Grignon DJ, Ro JY, Mackay B, et al. Paraganglioma of the urinary bladder: immunohistochemical, ultrastructural, and DNA flow cytometric studies. Hum Pathol. 1991 Nov. 22(11):1162-9. [Medline]. Kairi-Vassilatou E, Argeitis J, Nika H, Grapsa D, Smyrniotis V, Kondi-Pafiti A. Malignant paraganglioma of the urinary bladder in a 44-year-old female: clinicopathological and immunohistochemical study of a rare entity and literature review. Eur J Gynaecol Oncol. 2007. 28(2):149-51. [Medline].